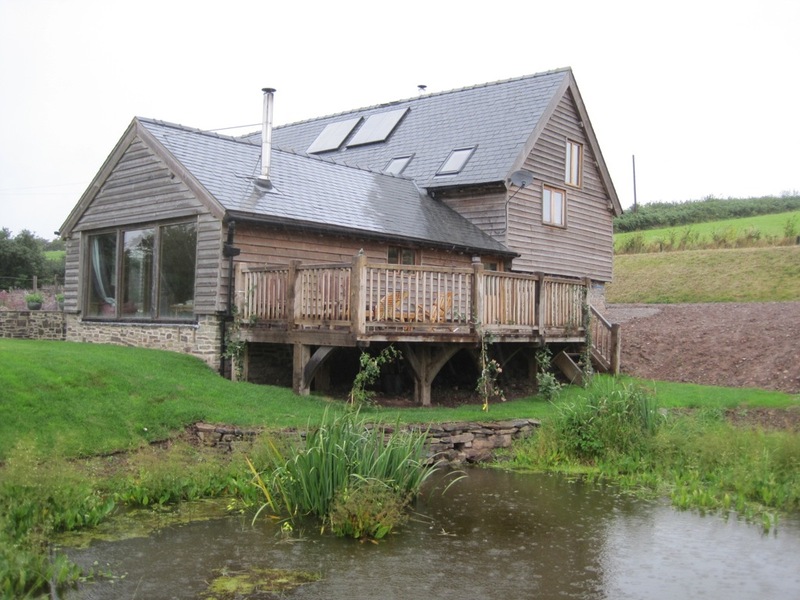 Peter had recently finished a major off-grid barn renovation near Presteigne in Powys and was now ready to complete the project by tidying up and landscaping the large area around the house. As on most building sites, this area had suffered during the build and was in dire need of some TLC. Peter employed local architectural designer John Williams to come up with a concept for an outside balcony/decking area that would connect the living space to the outside, and at the same time, cover up a complete dog’s dinner of unsightly drains, gulleys, water tanks and pipework that had remained uncovered after the building works were finished. Peter contacted Castle Ring Oak Frame to see if we could provide a green oak framed solution to fulfil the brief on this tricky sloping site strewn with awkward obstacles. John’s ideas formed the basis for the design, and after a careful survey we drew up the frame which was supported on ten posts, all of different lengths! While the frame was being put together in the workshop, Peter’s groundworks team was commissioned to put in the concrete pads. 10” of snow which hung around for several weeks, and a real dose of winter slowed things right down but eventually raising day arrived. To everyone’s great relief (and especially Rob’s as it was he who had measured the concrete pads with a laser level) the frame fitted perfectly. It took another couple of days to fit the stairs and complete the decking – I hope you’ll agree, it has transformed an unpromising area into a beautiful space with staggering views down the valley and over the pond.